Making Better Film Rolls, One Wind at a Time! There is no way to get around it. Every flexible film producer is faced with the challenge of producing quality film rolls with imperfect films. When considering the natural variation in resins, non-uniformities of the film formation processes, coatings and printed surfaces, it’s easy to see why there is no such thing as a perfect film. These slight imperfections are integral to the nature of film itself. So what do we do? We must turn to winding as a means to ensure imperfections do not stand out in appearance and are not amplified during the process. 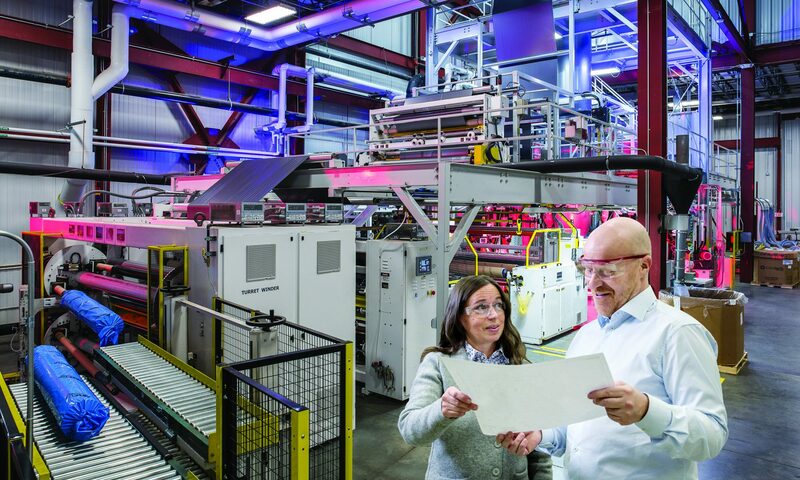 It’s also important to take an end-product approach, ensuring films can successfully support high-quality results for the customer. Roll Hardness – Roll density, or in-wound tension, is the most important factor in determining the difference between good quality and poor quality rolls of film products. Rolls that are wound too soft will go ‘out-of-round’ while winding or while being handled or stored. Rolls that are wound too tightly can cause blocking defect problems where the sheet layers fuse or adhere together, and can exaggerate web defects. Randomization of Cross Machine Variations – Some flexible packaging films, either by their extrusion formation process or by their coating and laminating process, have cross machine variations of thickness too severe to be wound without exaggerating these defects. To randomize cross machine variations either the web or the slitters and winder are moved back and forth relative to the web as they are being slit and wound; this is called oscillation. The rule of thumb for the maximum oscillation speeds is 25mm (1-inch) per minute per 150 mpm (500 fpm) winding speed. Profiling Roll Hardness – As a roll of flexible packaging film material winds, in-wound tension or residual stresses builds inside the roll. If this stress becomes greater during winding, the inner wraps towards the core will be put under high compressive loads. This is what causes a defect known as ‘buckling’ of the webs in localized areas in the roll. When winding non-elastic and high slip films, the inner layers will loosen; which can cause the roll to dish while winding or telescope when unwinding. To prevent this, the rolls want to be wound tight at the core and then wound with less tightness as the roll builds in diameter. The secret to the roll hardness structure is to start with a good solid foundation and then wind with progressively less in-wound tension. Achieving Roll Hardness – The winding tools to develop roll hardness are Web Tension, Nip Pressure from a pressure or lay-on roll or winding drum and Winding Torque from a center drive. 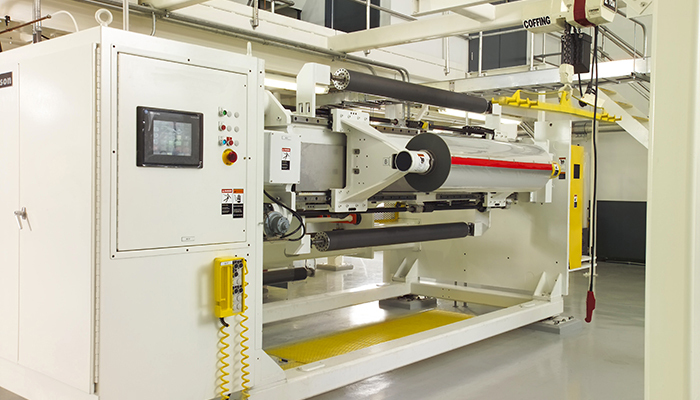 When winding elastic films, web tension is the dominant principle used to control roll hardness. When winding inelastic films, nip is the dominant principle. Torque winding is the force induced through the center of the winding roll, which is transmitted through the web layers and tightens the inner wraps of film. Measuring Roll Hardness – Film winding is often considered an art because the setting and programming of the Tension, Nip and Torque (TNT) varies depending on the winder, type of material, roll width and winding speed. To ensure the wound rolls are produced with consistent hardness, hardness measuring devices must be used. This enables the operator to check hardness and made adjustments to keep hardness within the acceptable range for that product. As you can see, there are several factors that must be considered to consistently wind good rolls. The winder operator’s job is not to camouflage poor quality flexible packaging products into shippable rolls. His or her responsibility is to handle films with slight imperfections and to produce quality rolls that will run without problems and maintain quality for the downstream customer. By learning more about the process and taking the right steps, it can be done! If you would like to receive the complete 17-page copy of this paper, please e-mail marketing@davis-standard.com. Also, to learn more about our products and service relating to winding and unwinding, click here.